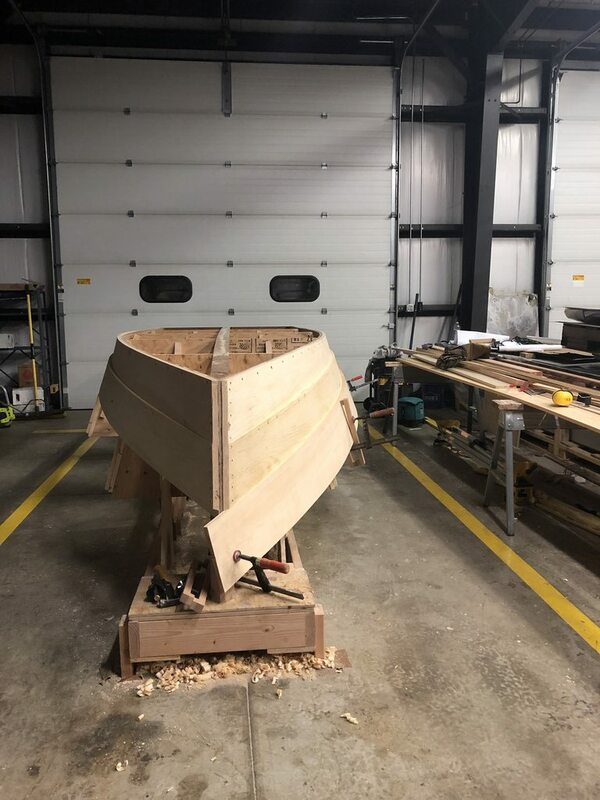 This will be my attempt to thoroughly document my girlfriend and I's build of Scott Gifford's Macomber 15', a traditionally built skiff modeled after the Westport River Skiff. I have built the Devlin Polliwog and the CLC Northeaster Dory, both stitch and glue. As a cabinet maker and finish carpenter, I'm excited to pick up a hand plane and put down the resins and give a go at a traditional craft. 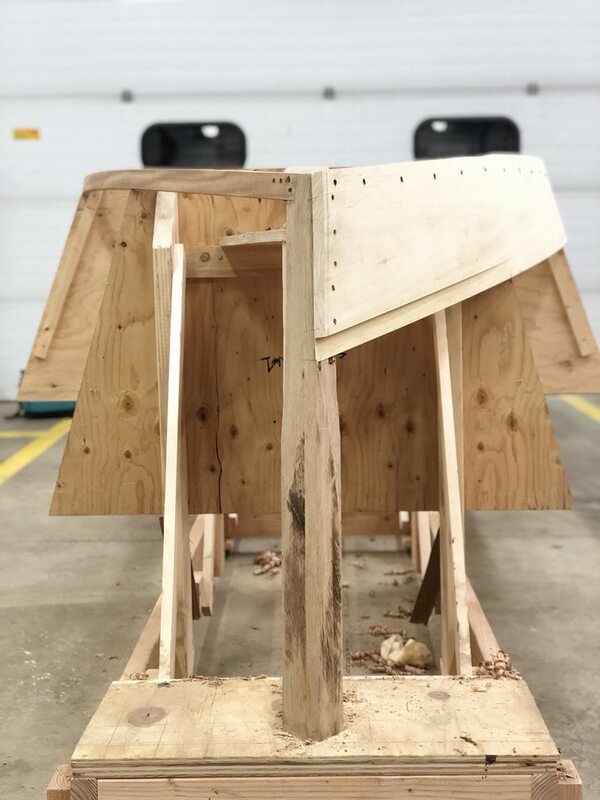 I'm going to share up to date costs and labor time as a resource both to myself and anyone who may be looking to build a similar skiff. I can't be the only one who wonders "but how much will it cost!" when eyeing potential designs. 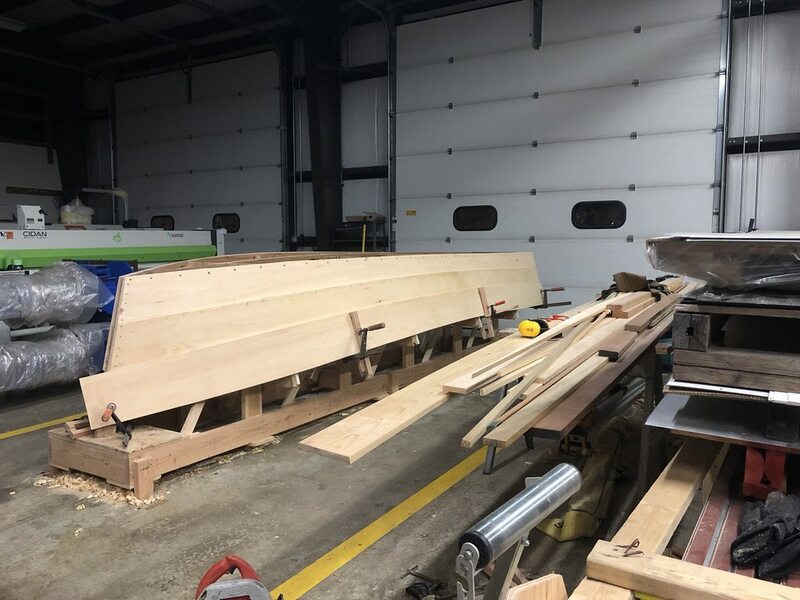 The transom will be 5/4 mahogany, side and bottom planking to be eastern white pine, and structural framing to be white oak. We're hoping we can complete the build for just over 2k not including the outboard. 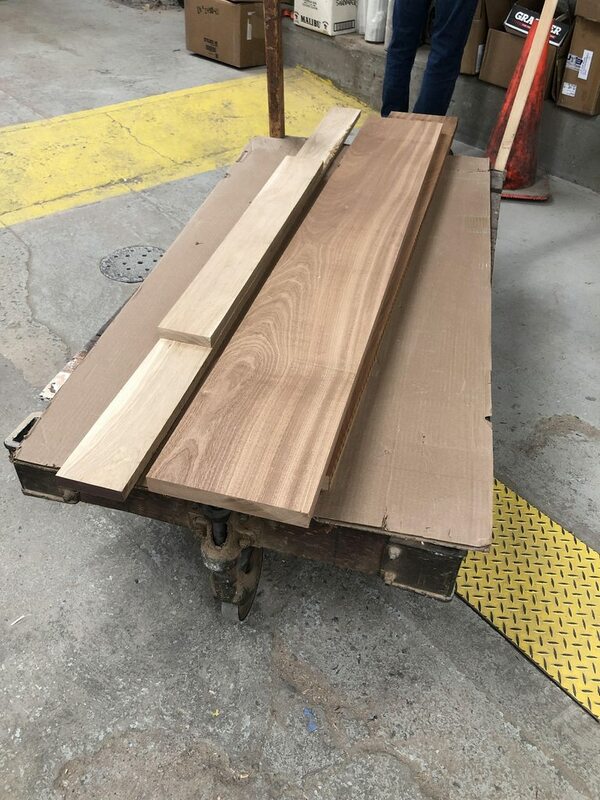 On Saturday, we cut the station molds from 3/4 exterior ply and ordered our fasteners. 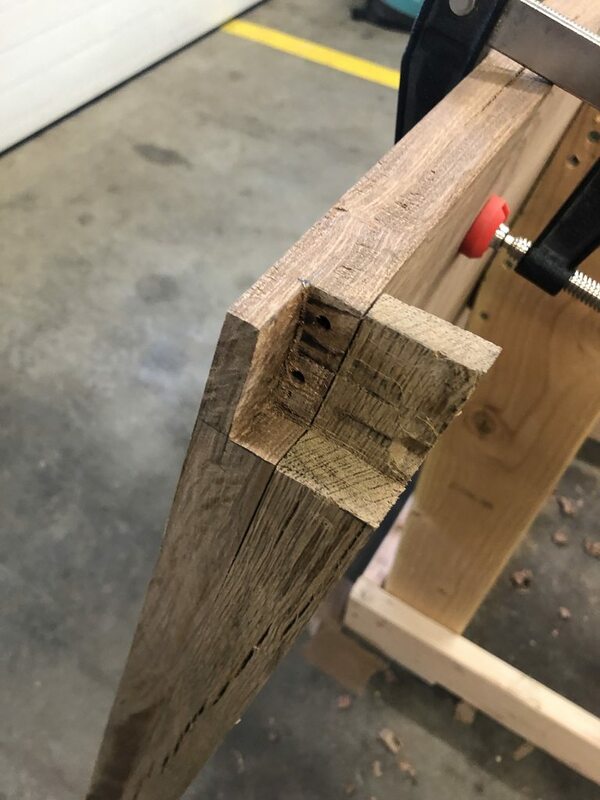 Using the cabinet shop and the makita tracksaw made this quick and easy. 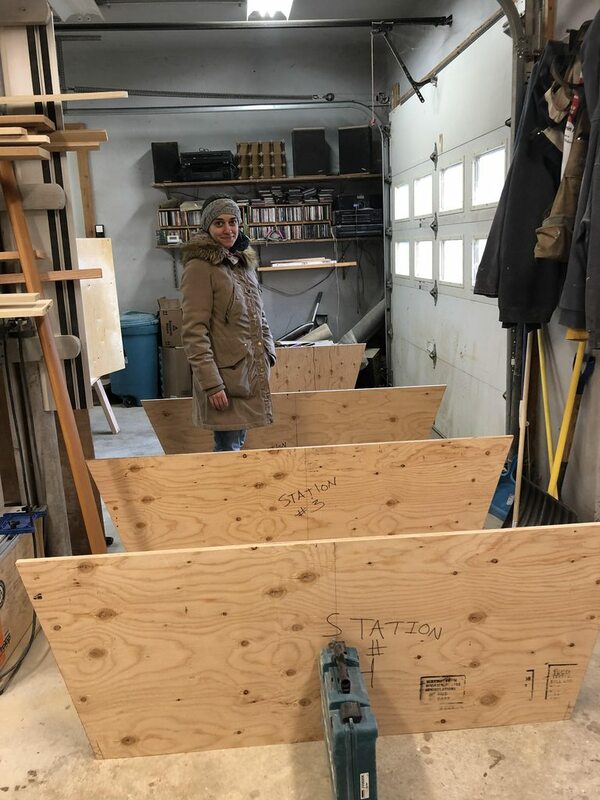 We have a detached single car garage at our house that we were thinking of building in, but came to the conclusion it is probably too small (~18' x ~12') and cold (uninsulated). Luckily I have a friend with a shop/warehouse space far too big for his current operation he is letting us build in. 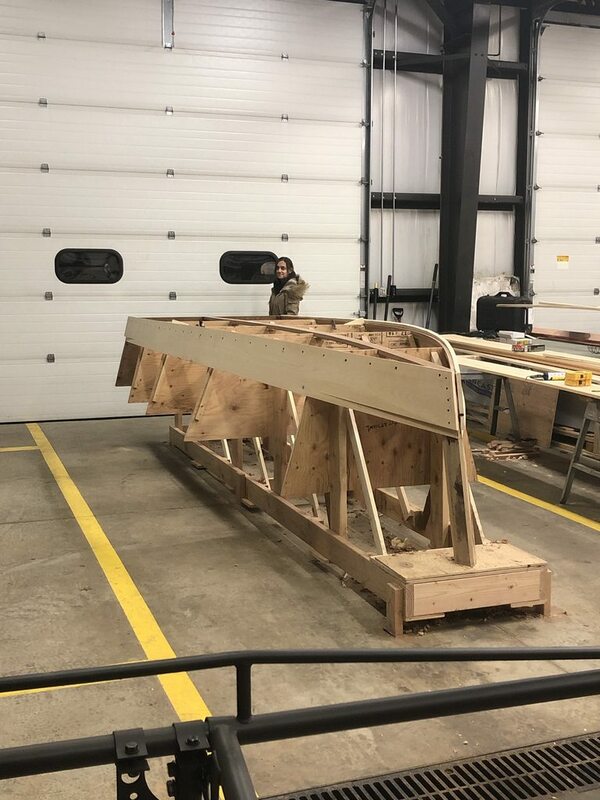 This week we aim to complete the building jig and glue up and cut our transom. Looks like a great project. I'll be following along. 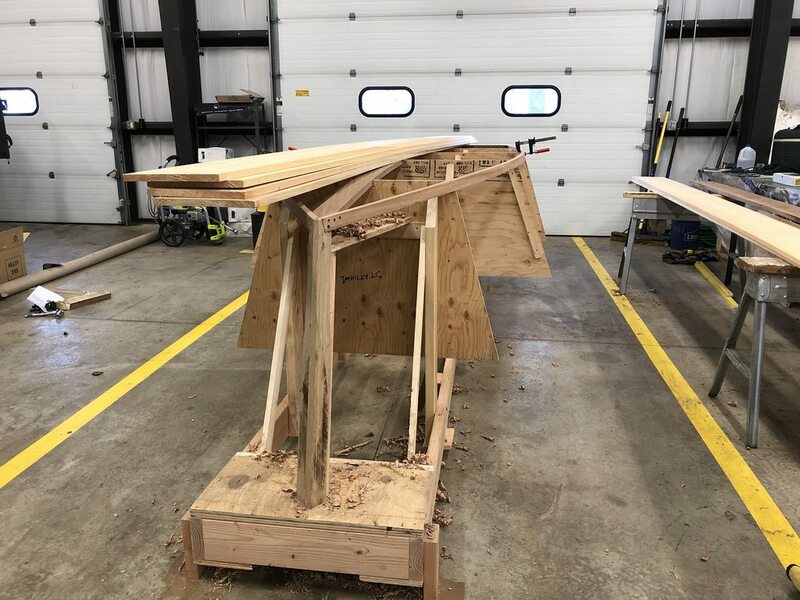 End of week 1 - we got the transom glued up and the stem cut out, ready to build the jig for week 2. 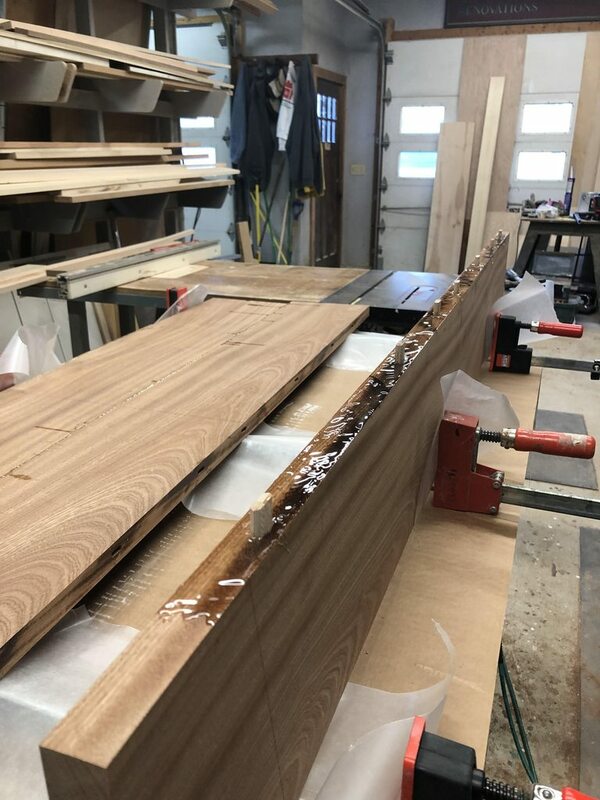 We used 5/4 Sapele for the transom and glued it up in three pieces. 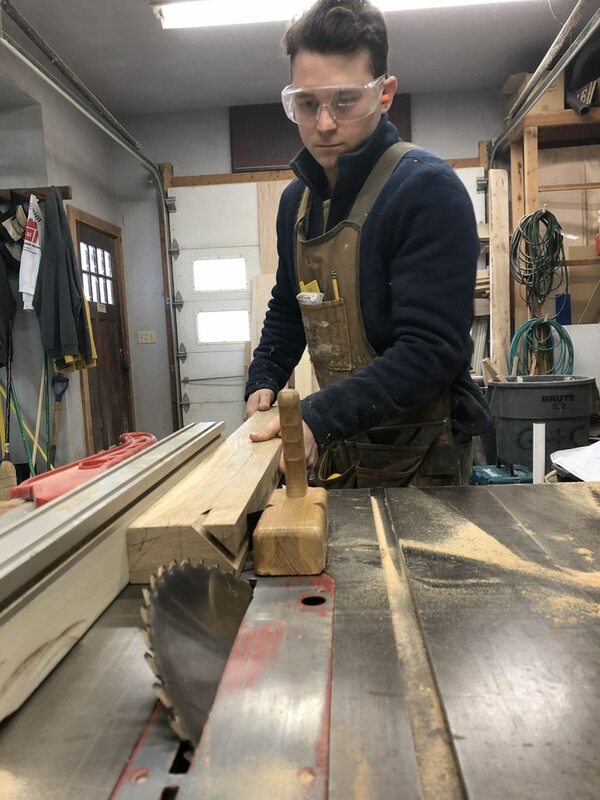 The lumber was bought rough cut to about 1 1/4" thickness, so we planed it down to 1 1/16". 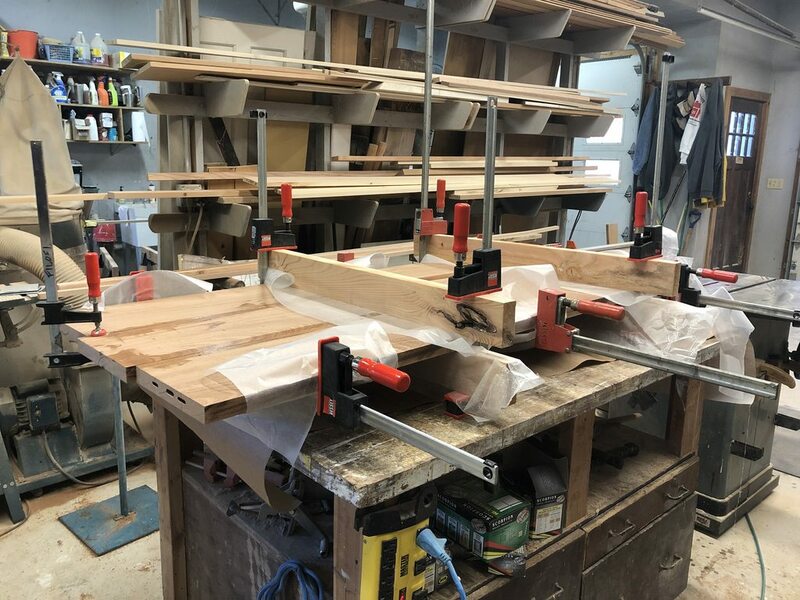 We used Jamestowns Total Boat epoxy for the glue up and used festool dominoes to align the joints and provide extra structure. The plans call for a spline or biscuits, but we figured dominoes would be a superior joint. The stem was laminated 4/4 (rough cut) white oak then sent through the table saw to get our stem angles. We used paint scrapers to scrape the excess epoxy once it had cured. Thanks to Lou at total boat for this tip. We're VERY happy we didn't need to use an orbital sander to get it all off. The transom turned out fantastic. Flat! - leaving Parkerville Wood Products with our Sapele and White Oak. 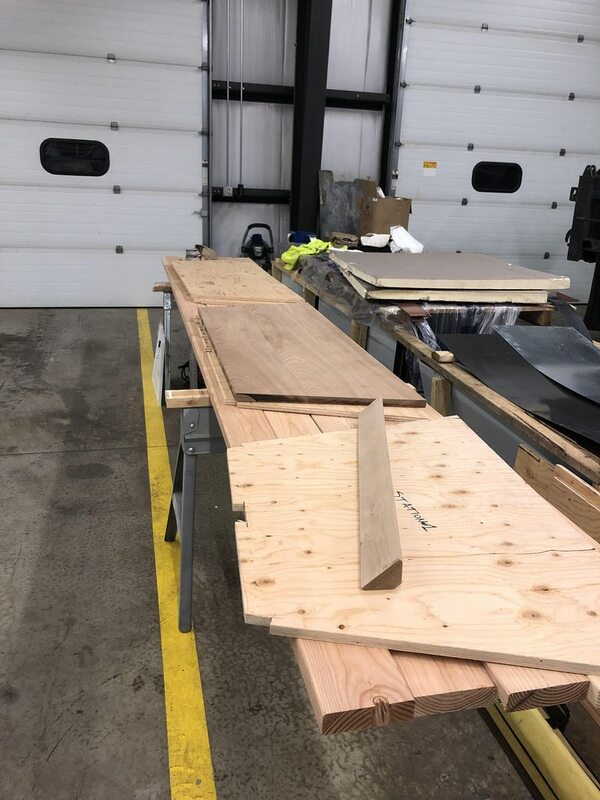 We rough cut at the yard so we didn't need to travel with 16' lengths on the truck rack. 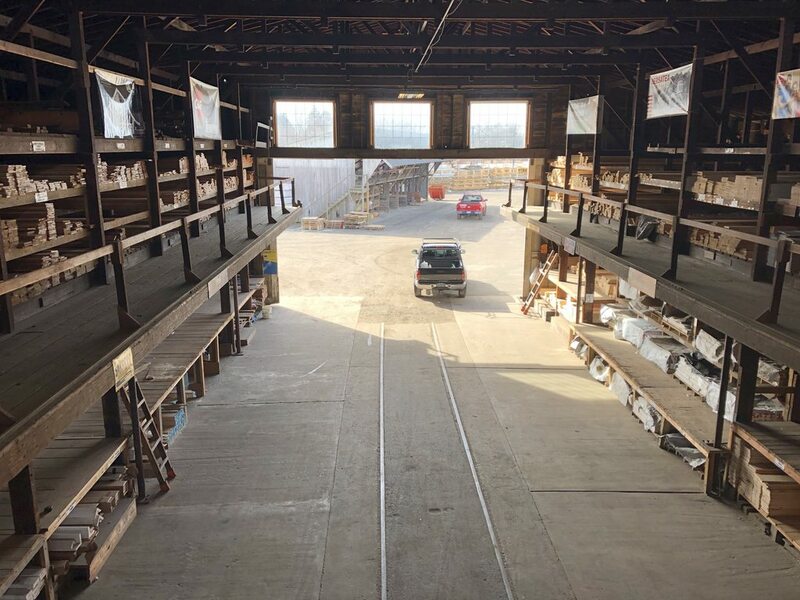 This lumberyard was about an hour away, located around Hartford, CT. Great supply though and some awesome exotic woods! - did someone say "dust collection"?? - wogodenboat forum meet Dana, Dana meet woodenboat forum. 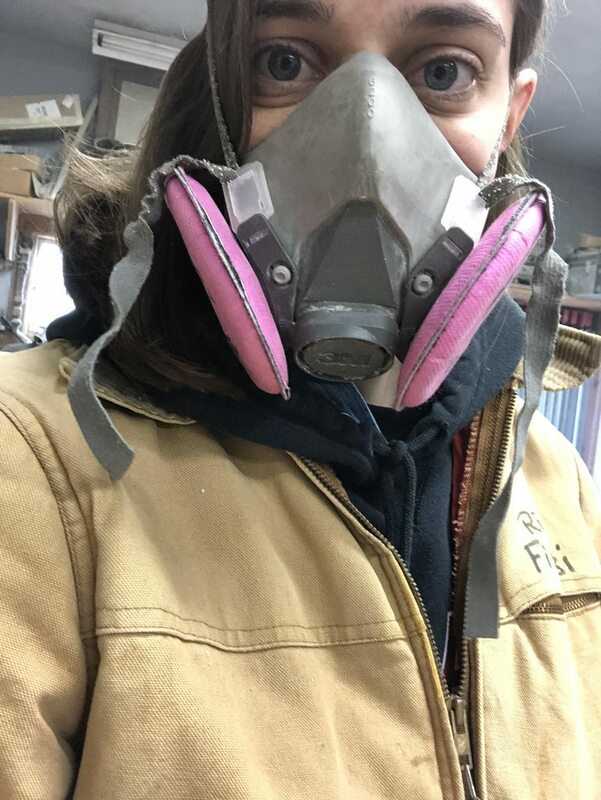 - did someone say epoxy dust? Is there much in the way of framework support for the transom? What you call dominoes, we call biscuits. Thats going to look great! 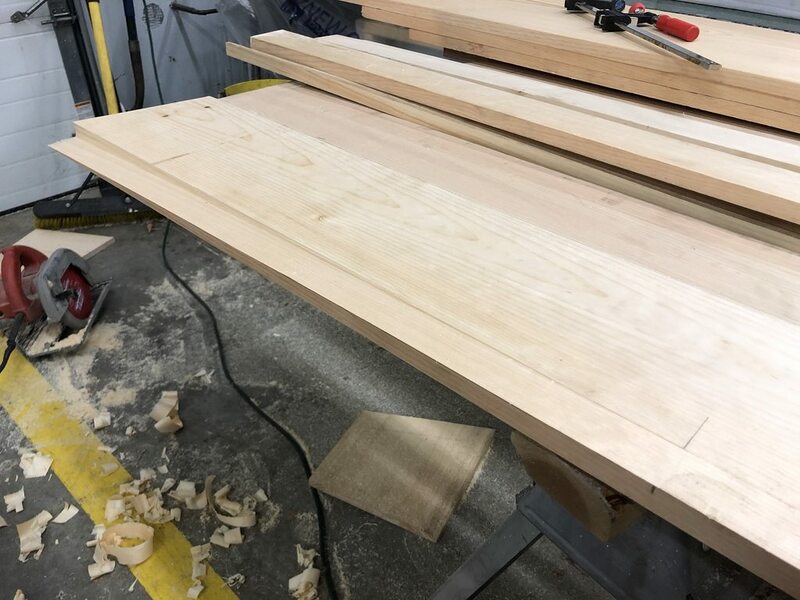 The transom will have an outboard plate with the grain running vertical, along with a transom knee and quarter knees. Thanks! This will certainly be a learning curve, any tips are greatly appreciated! 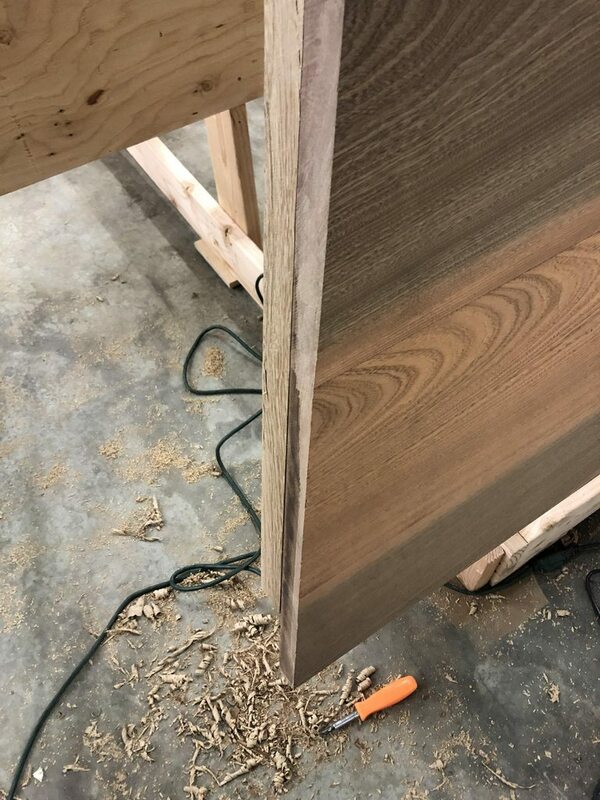 Is there an inside frame on the transom or does your planking fix direct onto the transom only? It can be done both ways, not familiar with that design, the transom looks thick enough for direct fastening. 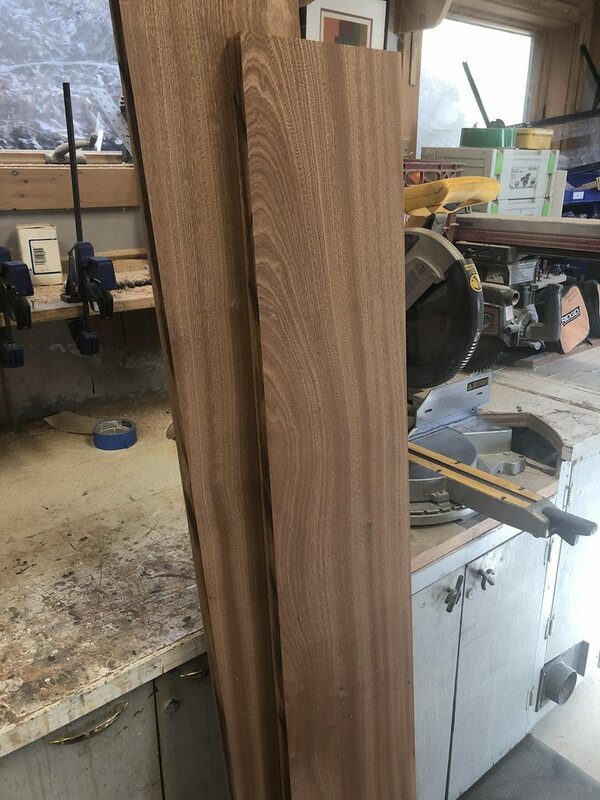 There will be white oak corner posts at the transom. I believe the planking will be screwed to the transom and the corner posts, but I’ll have to check the plans to be sure! What’s the best way to go about bailing the boat if left at a dock? We plan on keeping the skiff in the water, but I’d rather not have to go bail the boat out with a bucket every time it rains. Any thoughts? I keep my dinghy, a Cape Dory 10, at the dock all summer. To take care of rainwater I have a 12v motor cycle battery in a bracket under the center thwart to power an automatic bilge pump. The battery is good for about three months before needing to be recharged. I keep the pump in the lowest part of the hull which fortunately happens to be right under the center thwart so it is all pretty much out of the way. This might not work as well for you with a flat bottomed boat, but definitely better than nothing. Thanks for the tip Oldad, I think I came across one of your previous posts explaining this. 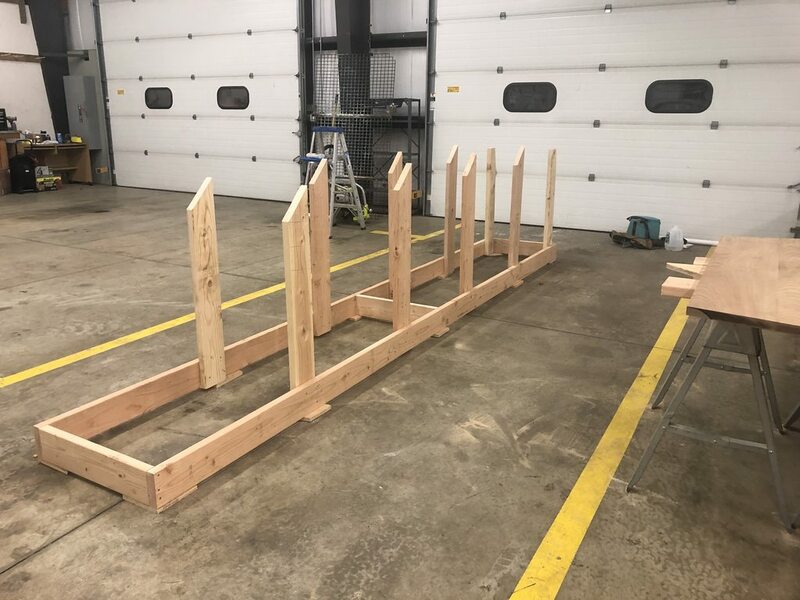 So we currently have most of the jig built, almost ready for the molds, transom, and stem to go on. How do I make sure everything is centered while attaching the molds? I was thinking about stringing a line since the molds have center lines, or setting up a laser. Maybe setting a laser 6' high or so near the stem of the boat and using the plumb line to center everything from the transom up? Sorry, I'm thinking out loud here. Our No. 5 jack plane and Stanley rebate plane came in today so I've been sharpening them tonight. Heres some photos of the action. "Dominos" are not really the same as "biscuits" I think. 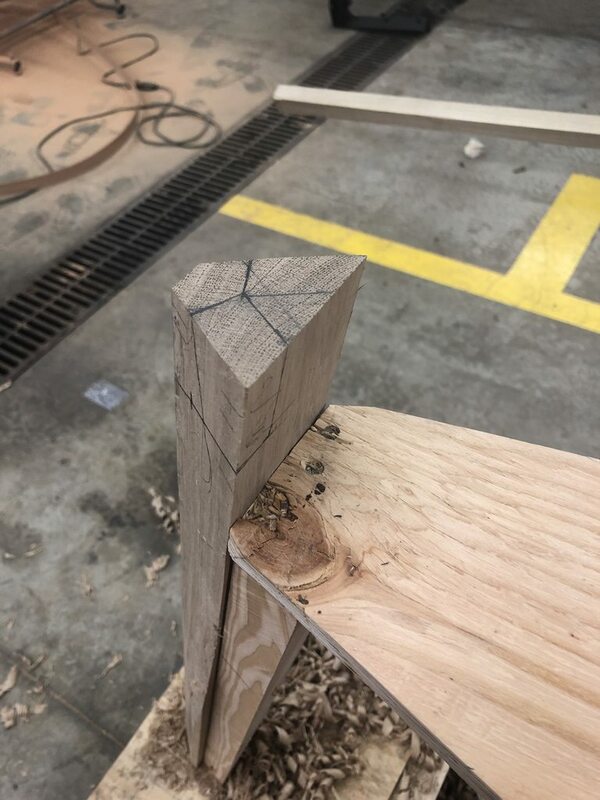 Festool's dominoes are much more substantial than the typical "biscuit joiner" biscuits; they more resemble a mortise and tenon join with what is often called "floating tenons" or "loose tenons." Takes a while to dry before you can paint over ---- is the only shortcoming I have experienced. Plan for that and you should not have any troubles. - I am starting to fair the transom and stem. The plans state to start fairing only where the garboard plank will land, about 8" down on the stern and 12" on the stem. Basically, fair for one plank at a time. Is this done mainly with a spokeshave? If done with a block plane, the block plane will ride up onto the unfaired portion and the plane iron will no longer contact the material. 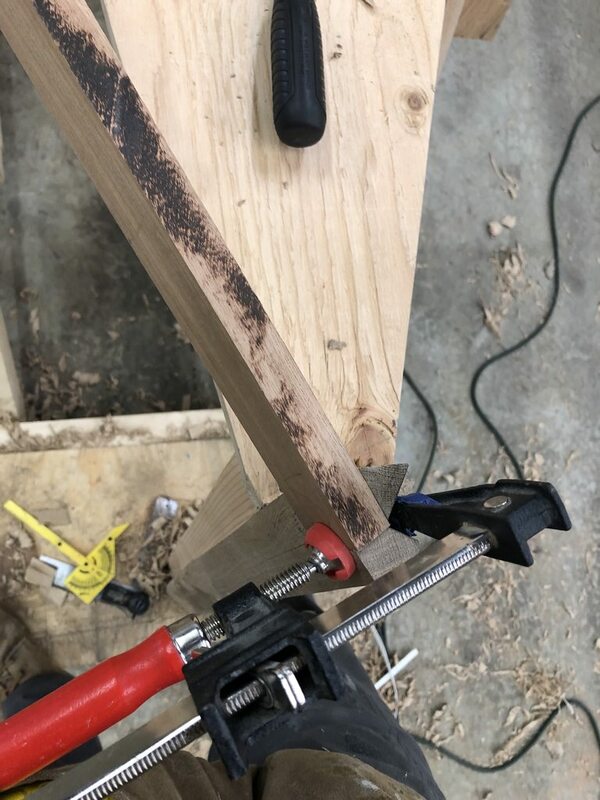 I am new to using hand tools and the learning curve is more than expected! Also, should I fair down a little past where the garboard plank will land? I don't see how I could fit a block plane or spokeshave beneath the plank to fair up close to it. - Should the corner posts be bedded to the transom? The plans don't state to bed them but I'm having second thoughts. I did however put a little bedding compounds on the tip of the screws. 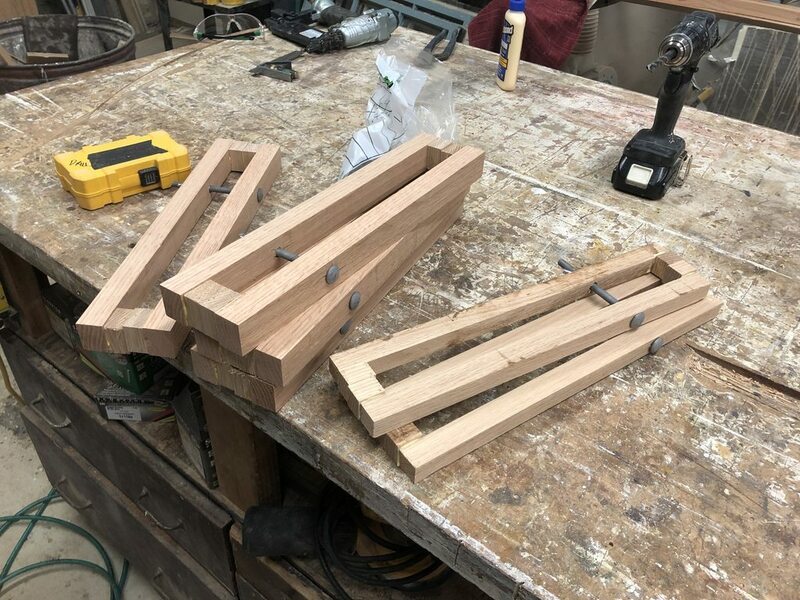 - When I place a batten across the chine pockets, they want to sit away from molds, thus changing the shape of the chine line. 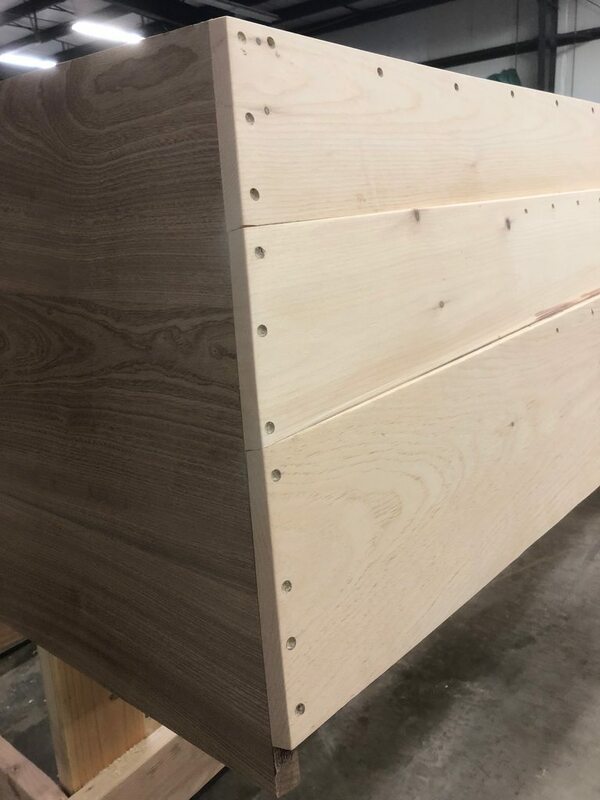 Once I fasten the chines, should I put a few temporary battens across the bottom so they hold to the molds until I start bottom planking? A lot of material to take out at the stem! Thanks for any help or just letting me know I'm on the right track (I have my doubts)! Great job so far, and I have liked this skiff since I first saw it in the Small Boats issue. It is a very useful design. 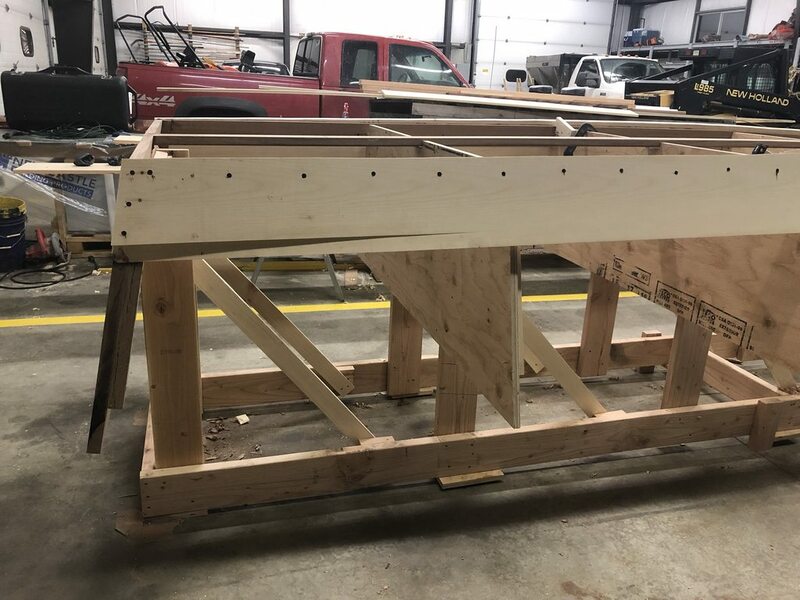 Is the Boat Life caulk specified as a bedding compound between all the mating parts, or just between topside lapstrake planks and between the bottom cross planks? Thanks! Last edited by Skiff Man; 03-15-2019 at 11:21 PM. It's really taking shape fast. Nice work. Today is big milestone for us, side planking is a wrap! We need to finish fairing the chines and cutting the planking flush with the stern and stem then on to bottom planking. 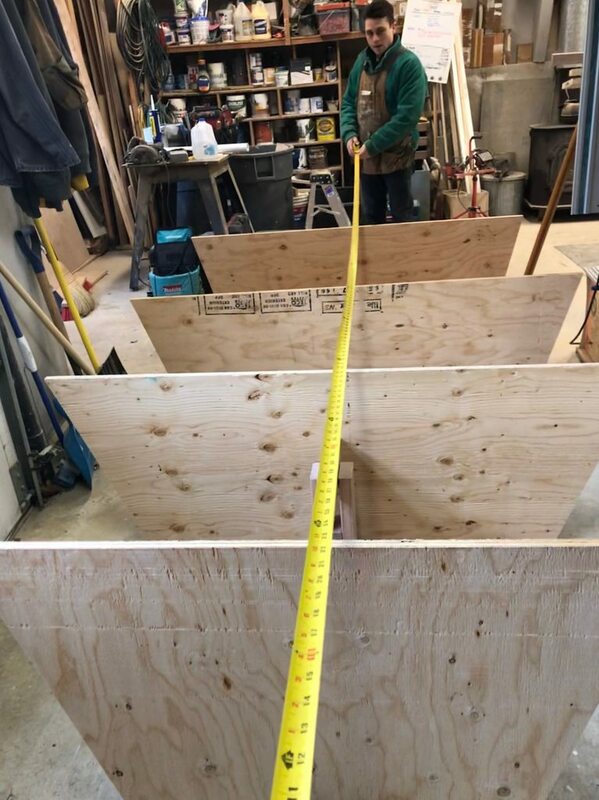 - The plans call for 5/4" eastern white pine bottom planking no wider than 5", but also suggests finding boards with vertical grain. 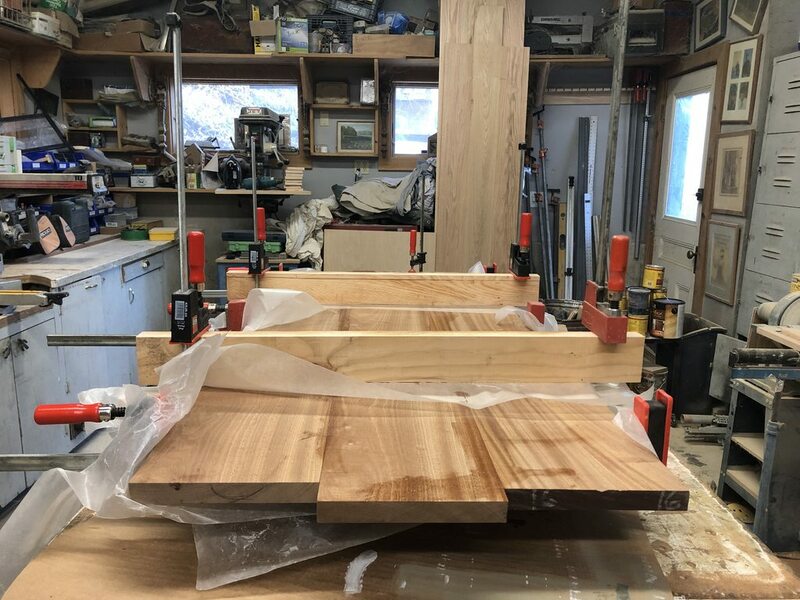 Can I just use 5/4 x 4" vertical grain Doug fir for this? 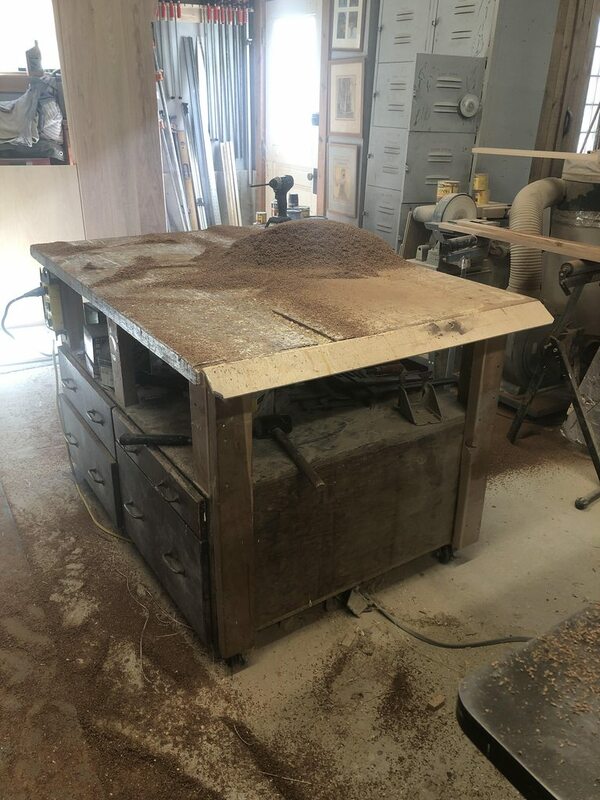 It's cheaper, and will be better than picking through all the stacks at the lumber yard looking for EWP with no heart grain. 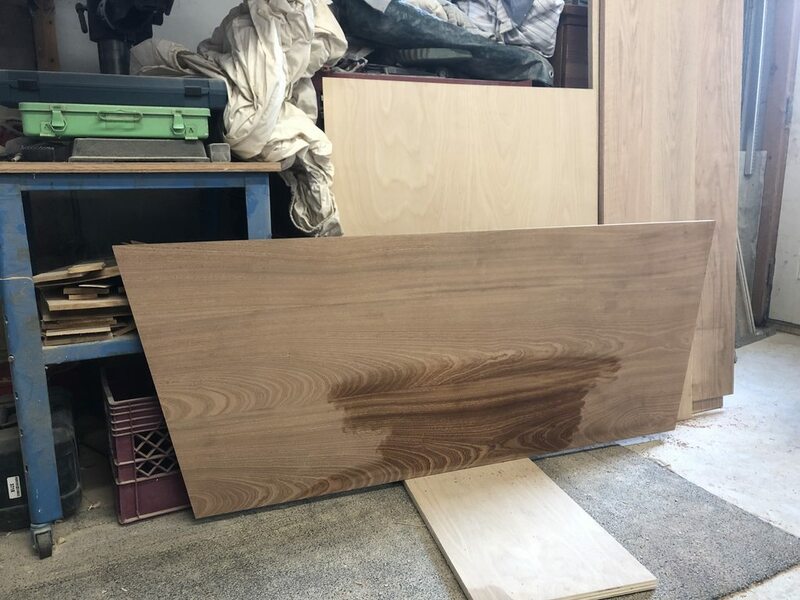 I saw Lou from tips from a shipwright use this as his bottom planking for his flat bottom skiff, so it seems like a good alternative. Will it swell enough? 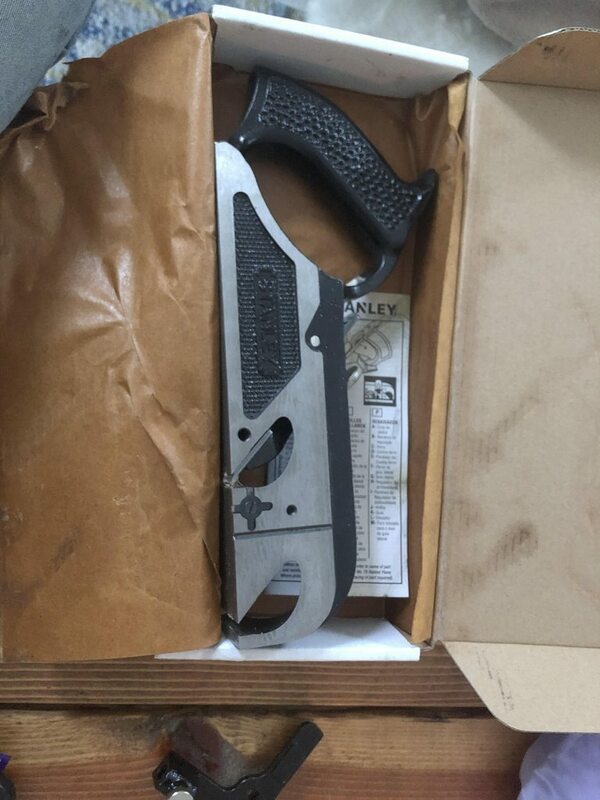 Also, it comes from the lumber yard with eased edges - maybe a 1/8" roundover. Is there a reason to cut them to square edge? 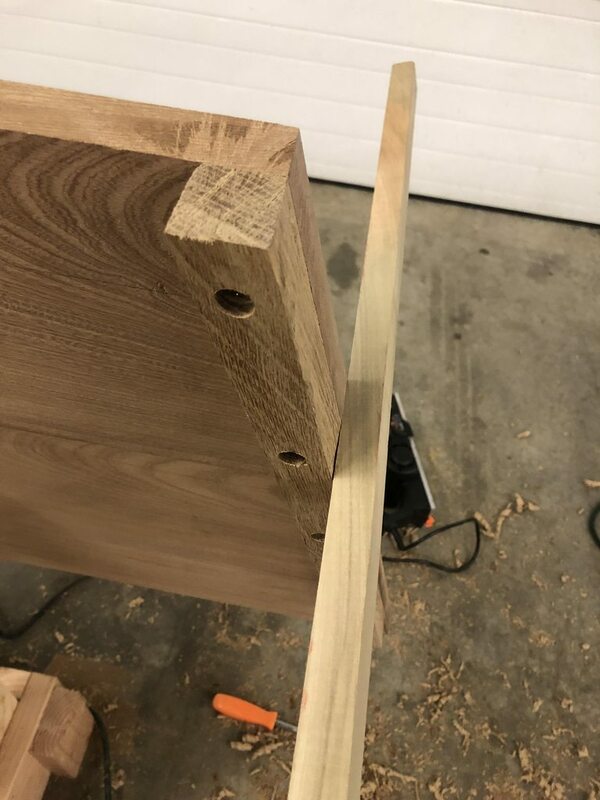 - What is the best way to trim the planking flush with the stem and stern? I was thinking of power planing until close enough to use a block plane or #5 to flush it up. Suggestions? 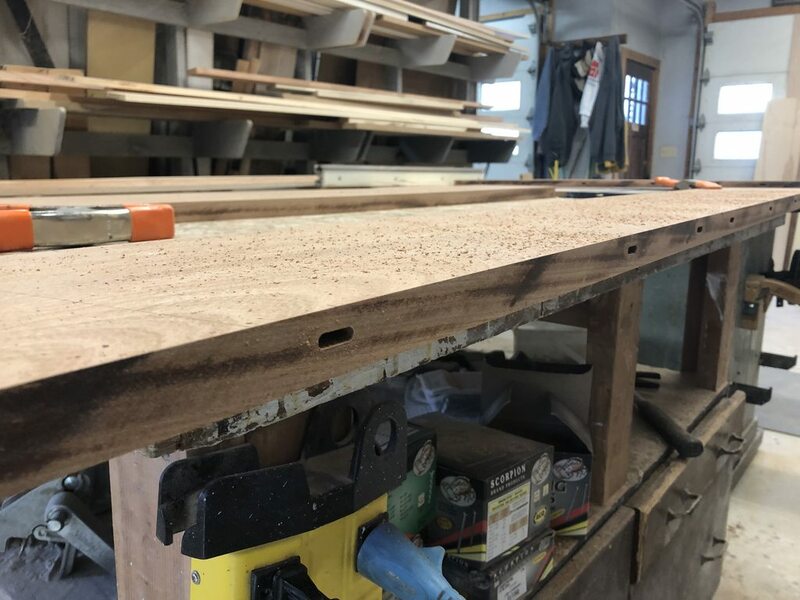 - What is the best filler to fill screw holes and sunk clench nails? Bondo may be too hard, but our usual minwax carpenters wood filler may be too soft and I believe it's water based. Try to find Eastern White Pine 3 1/2" to 5" wide, vertical end grain. Look at Wood-Database.com radial shrinkage values and you will see why (2.1% radial shrinkage). Atlantic White Cedar is the common planking wood around here (2.9% radial shrinkage). Douglas Fir is at 4.5%, which is up there with other strong structural woods. The denser the wood, the higher the shrinkage and expansion with moisture change in general. 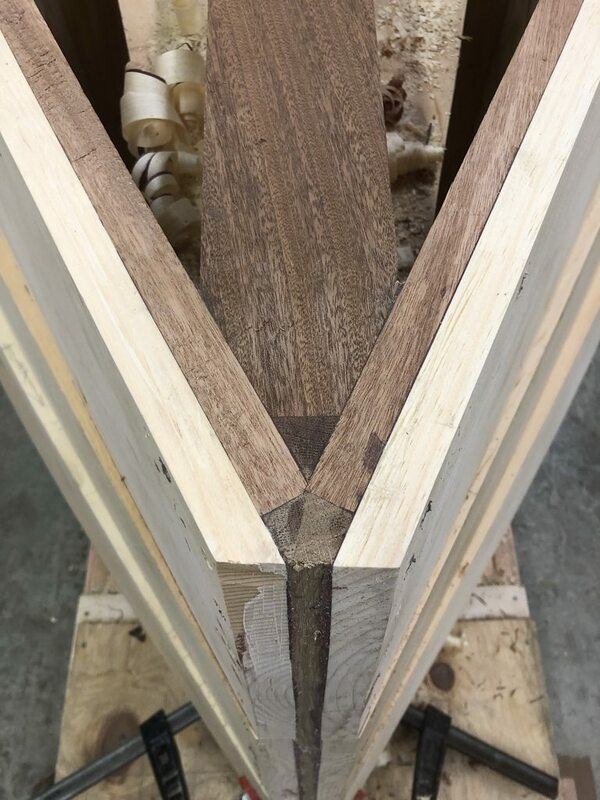 I level the chine log, transom edge and garboard strake with planes. The inboard bottom-most edge of the chine log is my cut-to line. 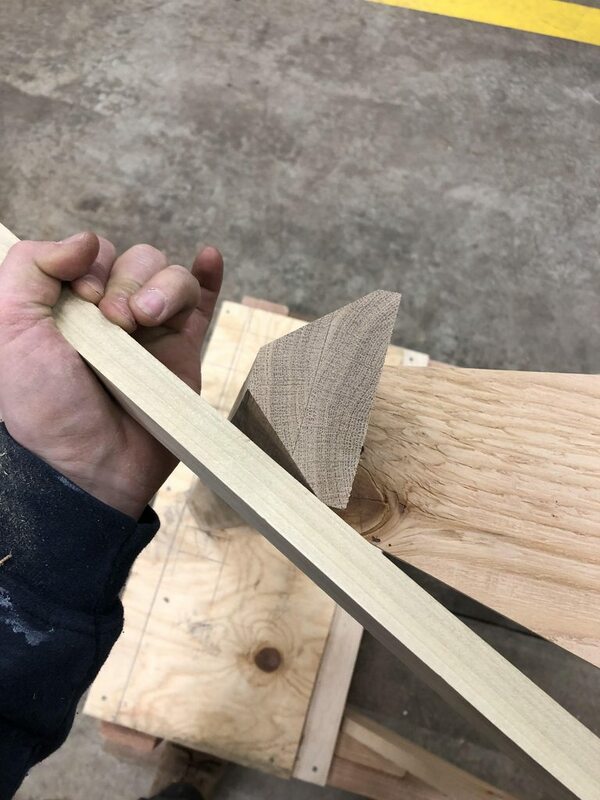 Use a straight edge to make sure your cut is level athwartships, and level fore-and-aft over the aft third or so of the boat bottom. The latter will ensure that the boat will lock-in and not porpoise at low, medium or high speed. Not sure exactly what to tell you on plugging compound. Make sure it is oil based, has some give, and that you can get it out to access screws if needed. Your paint will also need to stick to it. Famowood is a good old school filler. It is oil based and dries very fast. I found that it works best to scoop a bunch into a plastic bag then cut a corner off and use it like a pastry bag. That keeps the can open for the shortest time and the stuff in the bag from drying out until you squeeze it into the screw hole. P.S. 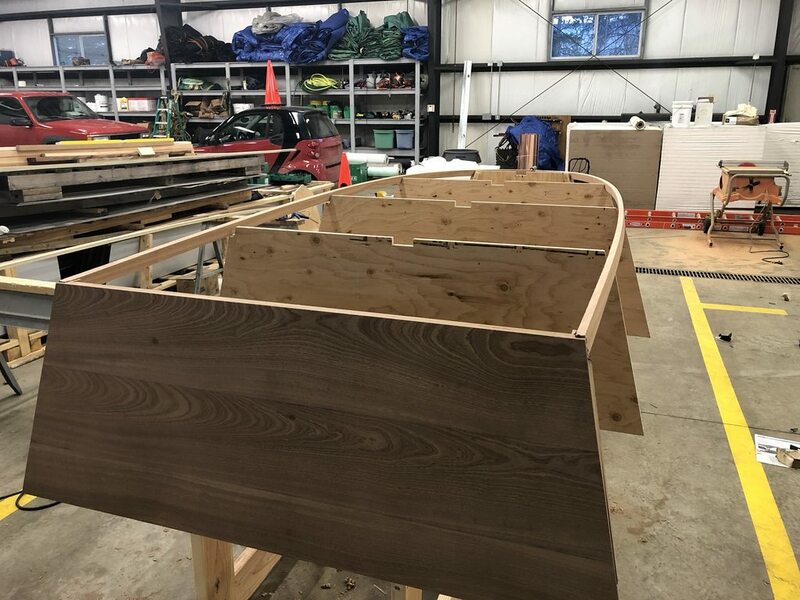 Great looking boat, it is coming along nicely. I like your plan. 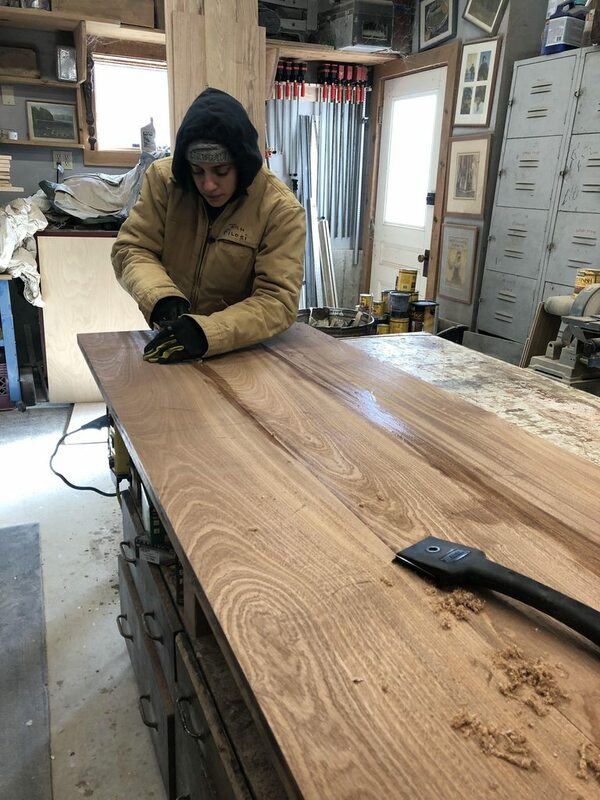 We used a belt sander, 60 grit, then a random orbital sander with 120 to fine tune the lines. On one boat we used Pettit EZFair fairing compound, because we planned to use Pettit primer paint over the top of it. 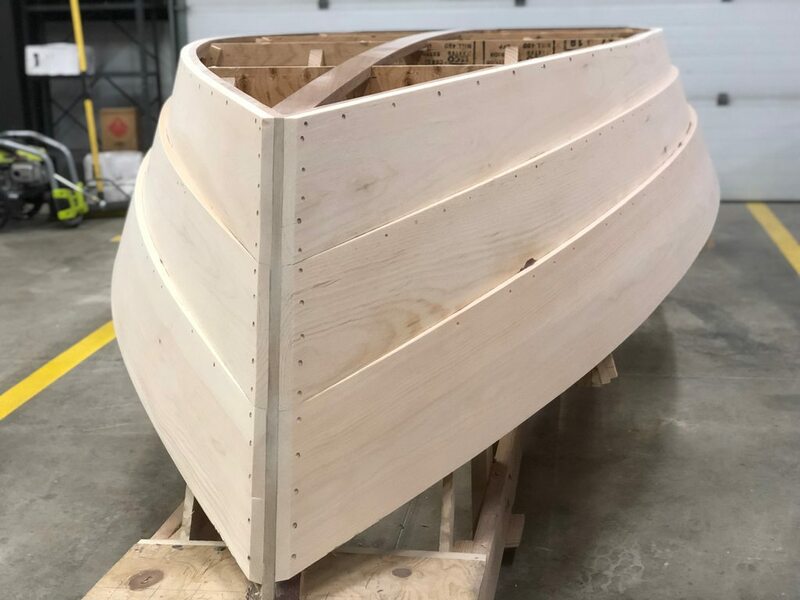 You'll want to use something that is compatible with the primer and paint finish that you plan to use, and suitable for the marine environment. As mentioned above, if you plan oil finishes you'll want something compatible with that. Last edited by signalcharlie; 03-19-2019 at 06:48 AM. On other boats we have been happy with TotalBoat TotalFair from Jamestown Distributors, we used their primer and WetEdge over the top of it. These are topside finishes for boats that we day sail. Interlux has a nice line as well, all available from JD (plug bell ding). You can chat with their Tech Team about what filler would be compatible with which finish, very important, we have seen a few cottage cheese reactions when the paint and primer and thinner combo did not match up. Last edited by signalcharlie; 03-19-2019 at 06:22 AM. Based on what I know about this boat from the Small Boats article and in general, the bottom paint needs to be an anti-fouling paint intended for faster power boats if you are going to leave it in the water. Tilt the motor up. The topsides paint and thwart tops would be a marine alkyd enamel, and the inside is treated with linseed oil and turpentine 50/50 applied until she will take no more (and wiped dry between coat sessions). BTW welcome and thanks for sharing the great pictures. We say "hey" back to you and Dana. 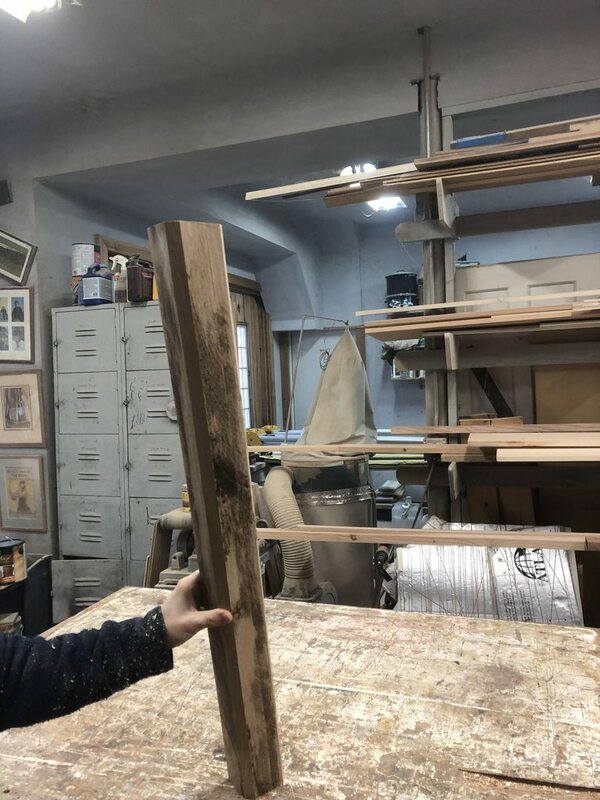 I saw Lou from tips from a shipwright use this as his bottom planking for his flat bottom skiff, so it seems like a good alternative. Will it swell enough? -Seems like a good endorsement to us. Also, it comes from the lumber yard with eased edges - maybe a 1/8" roundover. Is there a reason to cut them to square edge? -Thinking aloud. Seems that you'd want a smooth bottom without little dips every 4-5 inches? So cutting square would give you a flat bottom for either bottom paint of fiberglass. All those ripples would create drag and little pockets for water ingress/future rot. That's a Builder's Decision, I would to reduce water intrusion, but it makes future repair more challenging. Would be good to seal up the inner surfaces with bug juice, epoxy or paint and best to have a plan to keep water out of there. If your past that then you just keep an eye on it. Our Boat Carpenter friend told us "you can't keep water out but you can keep it in." Good advice as you start looking at putting in your interior, you'll need limber holes and access to compartments, if you plan to seal anything up. Y'all are making decisions now as to whether you are building a 7 year boat or a 100 year boat. Which sealant did you go with for the laps and what fasteners are you using? 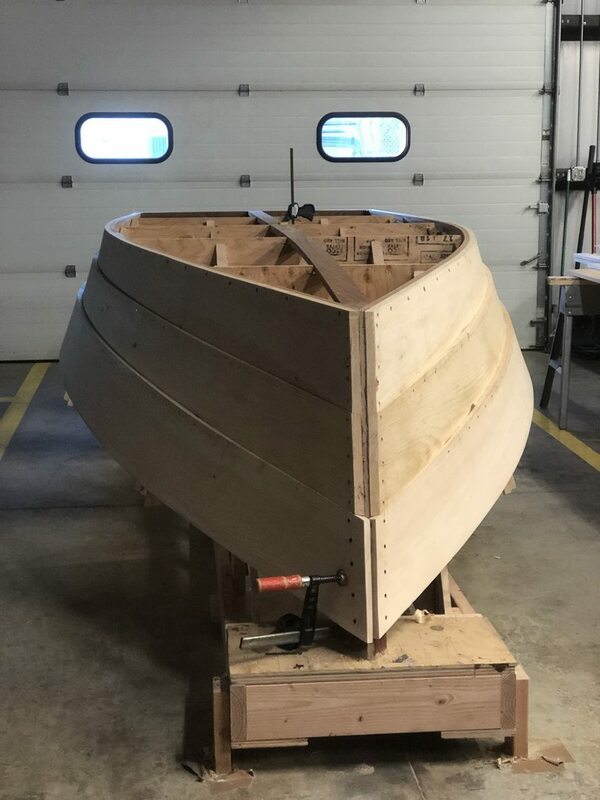 One of Pete Culler's favorite sayings: "Mostly, boatbuilding is simply correcting one mistake after the other, and possibly the first mistake is to begin....but it's so much fun." The Macomber 15 was also featured in the 2007 issue of Small Boats. Digital copies available for $3.95 USD. Last edited by signalcharlie; 03-19-2019 at 04:15 PM. - @signalcharlie - the plans called for boat life caulk between planks and a 1/16" even "smear" along the chines, stem, transom, and in the gains. We are using all bronze fasteners. I spoke with the designer, and he recommends Interlux Below Waterline Seam Compound to use as filler. He also recommends to prime the areas first. This got me thinking about paints. I understand I should put a antifouling bottom paint under the waterline, and I'll probably end up using interlux topside paint above the waterline. Do I still prime below the waterline if I'm counting on the bottom cross planking to get wet and swell tight? Wouldn't that defeat the purpose of the primer? If so, will any marine primer do? Not too much visually to update on. 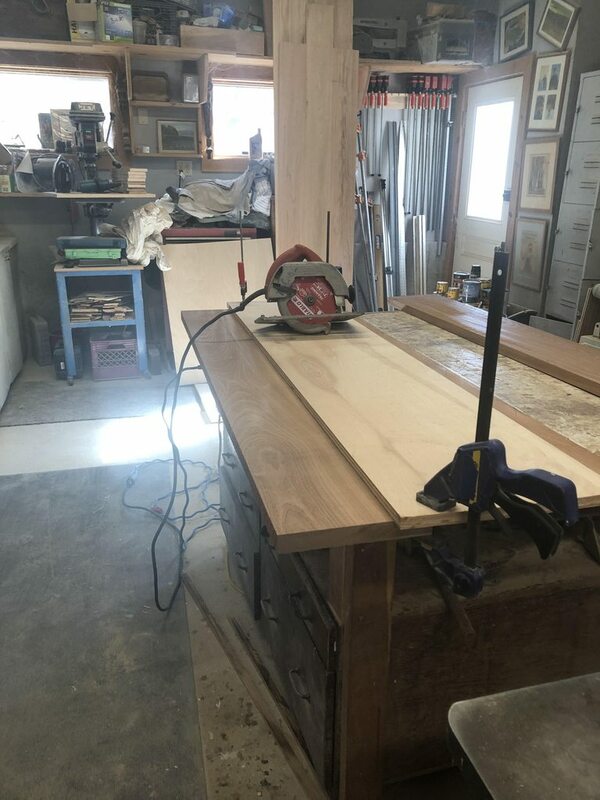 I got the planking trimmed flush using a flush cut pull saw and an orbital sander, sanded the planking, and faired the chines for the bottom planking.